Since St. Patrick's Day falls on this coming Sunday, I made this pot of gold bento and also I would like to wish everyone the luck of the Irish. I freehand cut the pot sandwich and added popcorn as gold. Lettering is from cucumber peel and a rainbow baran. Seedless green grapes in a silicone cup and edamame. 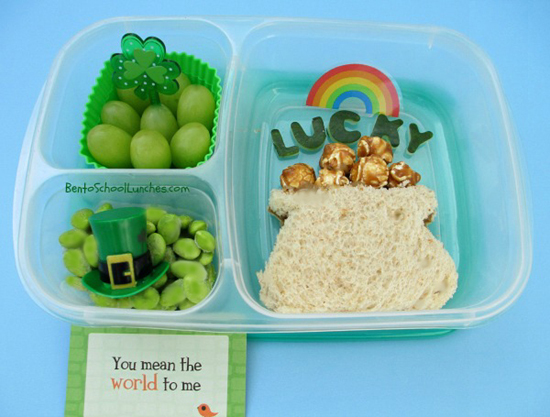 Included a Lunchbox Love note, a cute green top hat and a shamrock pick and packed in an Easylunchboxes container. This is so cute! Love it! Have a good weekend! Hi. Just wanted to let you know that used this lunch in my St. Patrick's Day lunch roundup on my blog and linked back. I hope that is okay. Caramel popcorn….genius! Nicely done, Rina!